Riding on unfathomable volumes of industrial expertise, we are offering an excellent range ofModular Connector ODU-MAC. 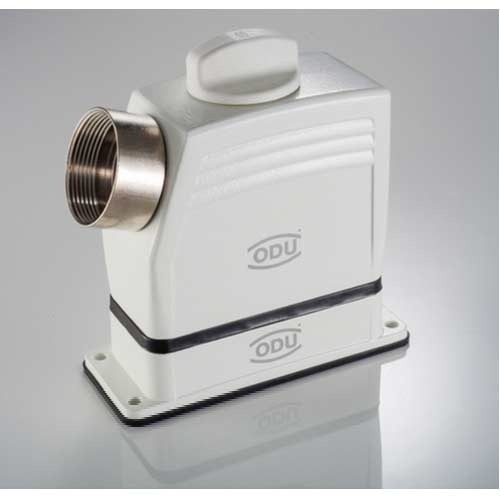 The perfect way to make a custom connection: to transfer signals, current, data rates, media like air or liquids or even light waves, a variety of interfaces can be combined in one ODU-MAC system according to your needs. The ODU-MAC is available in two basic versions. Our clients can choose between the docking version in an aluminium frame that can be flexibly cut to length for automatic mating and a design in the DIN housing for manual mating. The intelligent way to make a custom connection: whether you have to transfer signals, current, data rates, media such as air or liquids or even light waves – a variety of interfaces can be combined in one ODU-MAC system according to your needs. The result is an effective, compact and robust overall connection with functionality that cannot be surpassed. Being confused by a large number of connections is a thing of the past – today's solution is an individually tailored ODU-MAC. The ODU-MAC is available in two basic versions. You can choose between the docking version in an aluminium frame that can be flexibly cut to length for automatic mating and a design in the DIN housing for manual mating. ODU is one of the leading international suppliers of connection systems. Our company employs 1,650 people around the world. The group of companies has its headquarters in Muhldorf am Inn, Germany, roughly 80km east of Munich. ODU also has production sites in Sibiu, Romania, Camarillo/USA and Shanghai, China. The ODU Corporate Group has representatives for its products around the world and an international distribution network. This network includes seven sales companies in China, England, France, Scandinavia, Denmark, Italy and the USA and numerous global sales partners. The family owned company is financially independent and was founded in 1942. With a customer focus and a wealth of practical industry experience, ODU has established itself as a leading supplier of electrical connection technology. Connections from ODU ensure reliable transfer of power, signals, data and media in numerous application areas: in future-oriented growth markets such as medical technology, military and security technology, and energy technology, as well as in established sectors such as industrial electronics, measurement and testing technology, and automotive technology.